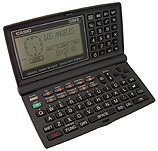 Comment Casio made the same model for Tandy, the EC-319. Comment Series also called BOSS - Business Organizer Scheduling Sytem. 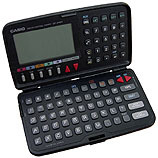 Other models : SF-4600, SF-4600E. 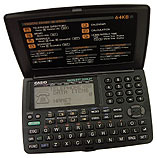 Comment Close to the 4900C with extra functions: To do, Expense, currency conversion. Comment Although the two SF-5300 offer virtually same features, their case design and internal hardware are quite different. 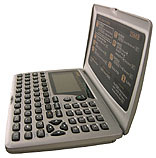 Functions Phone book, business card, Memo, Schedule, Calendar, Home/World clock, 12-digit calculator with big digits. Comment Some versions were sold with a leather bag. 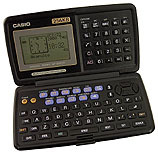 spelling-checker ($100), Spreadsheet ($190), Personal expense-manager ($130), PC-Link ($130), CasioLink for the Macintosh ($130), B.O.S.S. 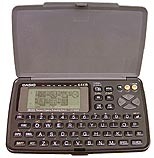 Diskware for IBM compatibles ($23), Lottery/horoscope ($23); Lifestyles Weight Loss Plus ($23), Barron's Business Travel Translator ($23), OAG Travel Planner($23).